Due to popular request through the blog and social media, I am posting about introducing solid foods to your baby. 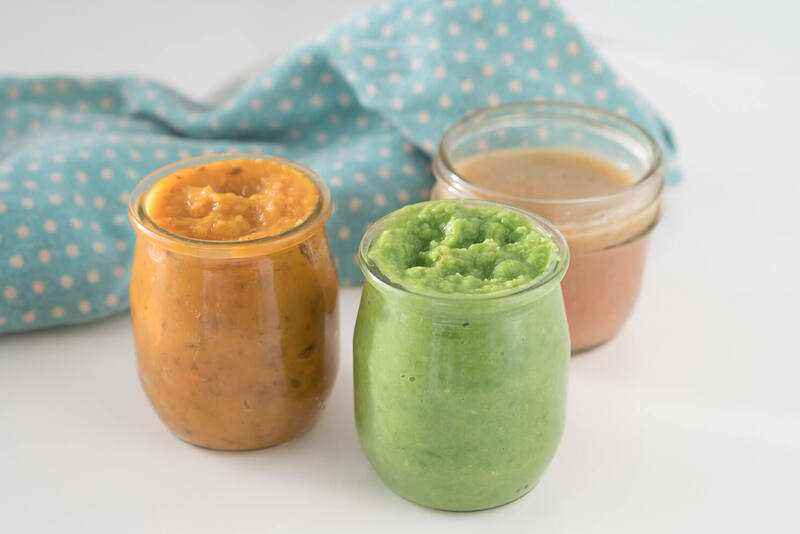 I’m also going to share some great advice for new mamas on baby food introduction from Dr. Jonah and Dr. La of the Toronto Centre for Naturopathic Medicine. I’ve been having so much fun introducing foods to Vienna! I started at about five-and-a-half months because she got her two bottom teeth in and she had been grabbing at my plate. For about a month prior to her first food, she was watching me like a hawk every time I ate and imitating me chewing, as well as grabbing my plate at every opportunity. I figured it was high time to let her chow down on something aside from mama milk once she was sitting upright and could hold her head up really well. Most babies are ready by about six months of age. And she's trying hard boiled eggs for the first time this week! If you’re not sure about a particular food, check with your primary care practitioner for advice (e.g., your pediatrician, naturopath or certified nutritionist). You may have heard that the latest research advises introducing potentially allergenic foods earlier, rather than waiting until your child is older. Are you scrunching up your eyebrows, wondering how can this be when the original advice was to delay introduction of foods to prevent allergies? Well, things have changed! New evidence is challenging what we once thought, including research showing early introduction of potentially allergenic foods actually decreases likelihood of developing allergies later on. If you have a severe allergy to any food, I would recommend you first discuss with your paediatrician or naturopath before introducing that food to your baby regardless of the above recommendations. Also, observe your baby for signs of allergy immediately following introduction of a new food. Yes, absolutely. Non-organic foods contain pesticides that can disrupt hormones, negatively impact the immune system, and more. Babies weigh much less than adults and are not equipped to handle pesticides. It is really important that you chose organic as often as possible to avoid exposure to unnecessary and potentially harmful chemicals. You can find out which foods have the highest and the lowest level of pesticides here. 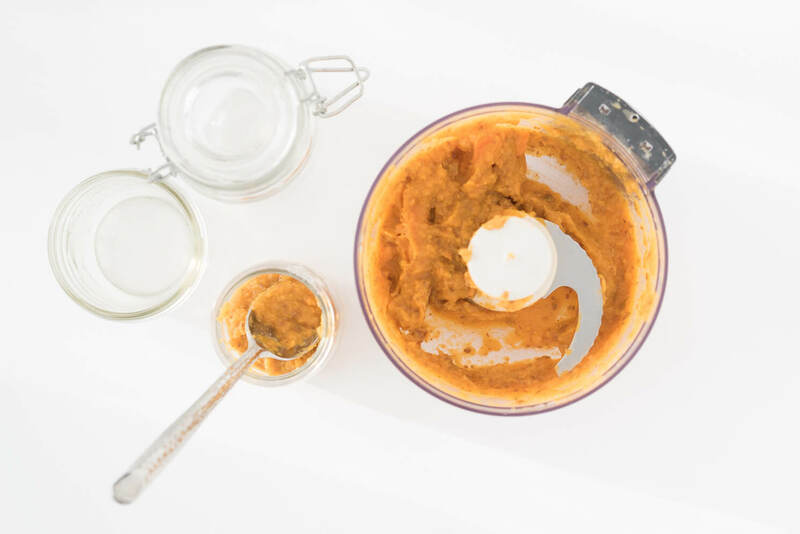 If the skin is edible – such as is the case with apples, pears and sweet potato – then yes, you can just puree the food with the skin on after it’s cooked. However, if your babe has a sensitive tummy, you might want to peel the skin off first. Vienna was fine, but if your baby is gassy, constipated or generally fussy after you feed them foods with the skin on, you may want to try them without skin and see if there is a difference. Keep in mind, this could also be a reaction to a whole food not agreeing with your babe. Let your little on take the lead. Remember their stomach is still teeny tiny so don't be surprised if they are satisfied after a tablespoon when you first start. Plus, when you are beginning intro of foods it's totally normal for your baby to not be interested right away. Never force your baby to eat. Let them lead the way. Offer the food and stop when baby is showing signs they are finished such as turning away. Vienna started out eating only a few spoonfuls and now at 7 months she's eating 2 solid meals per day and less than a 1/4 cup of food total at a meal -- mind you, she's eating maybe half of that when you consider how much is on her face, bib, and high chair haha! This was the very first food I ever gave Vienna when she was 5.5 months because it is nutrient-rich and super easy to prepare. It is a great source of both soluble and insoluble fiber and fat (rich in calories). 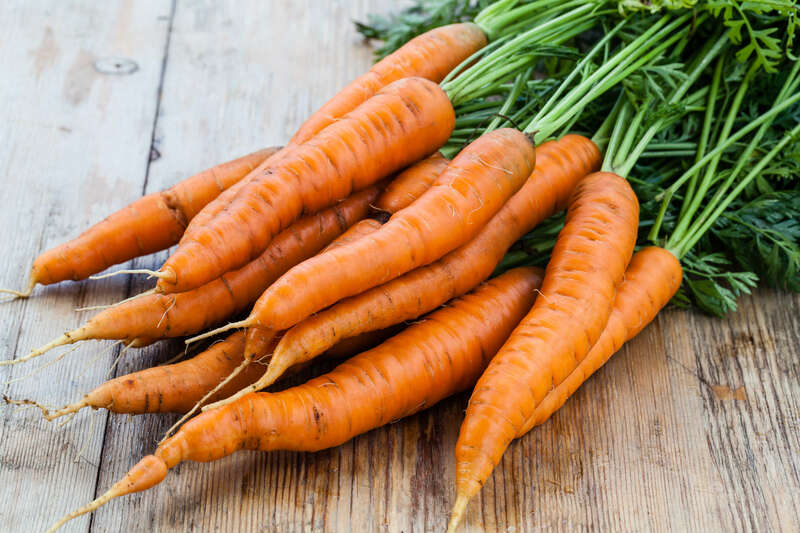 It is also rich in B vitamins, vitamin A and minerals such as magnesium and potassium. It is a wonderful first food to support growth and development. 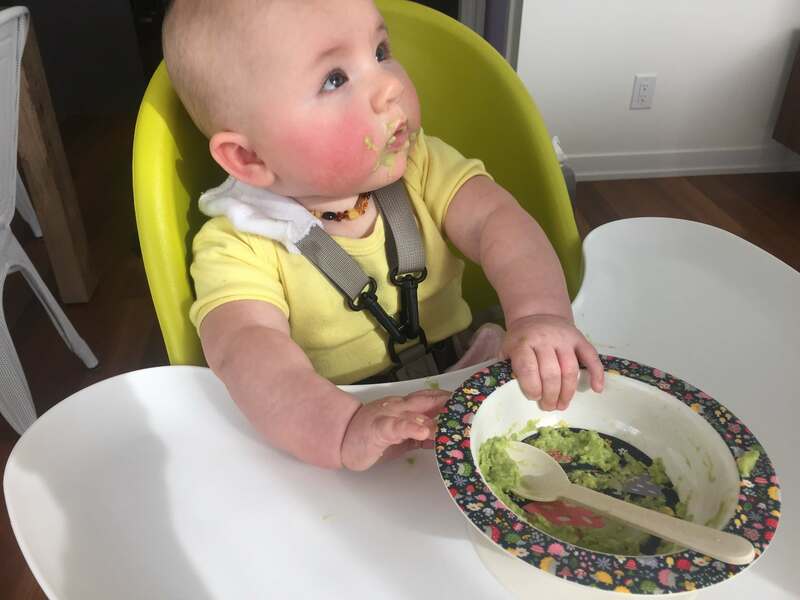 When introducing solids, many babies get constipated so avocado is a great choice because the fiber helps prevent constipation. Vienna wasn't thrilled about avocado but a few days later I added banana and she enjoyed the combo of banana and avocado together. She was teething in the photo below, hence the very red cheeks! All you need to do is mash it with a fork. Avocados freeze really well too. 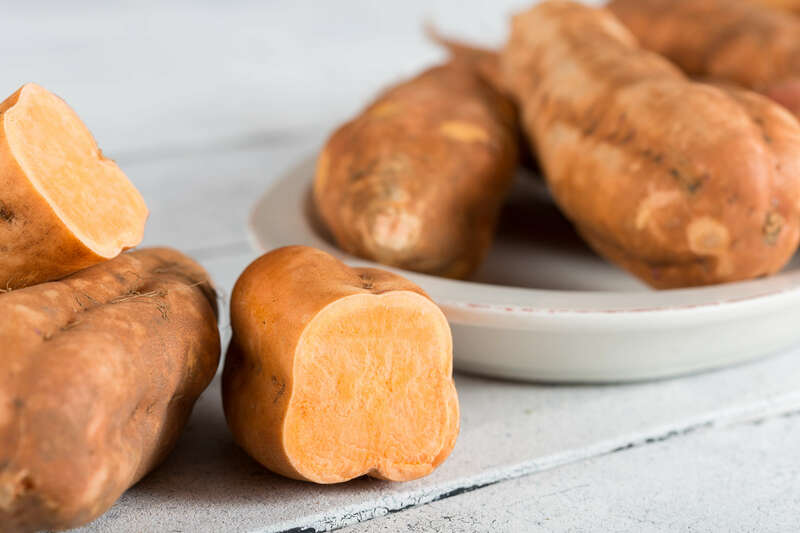 Sweet potato is another incredibly nourishing food. It is a naturally sweet vegetable making it an ideal first food because babies are used to the sweetness of breast milk or formula. Full of nourishing vitamins and rich in minerals such as calcium, magnesium and more. 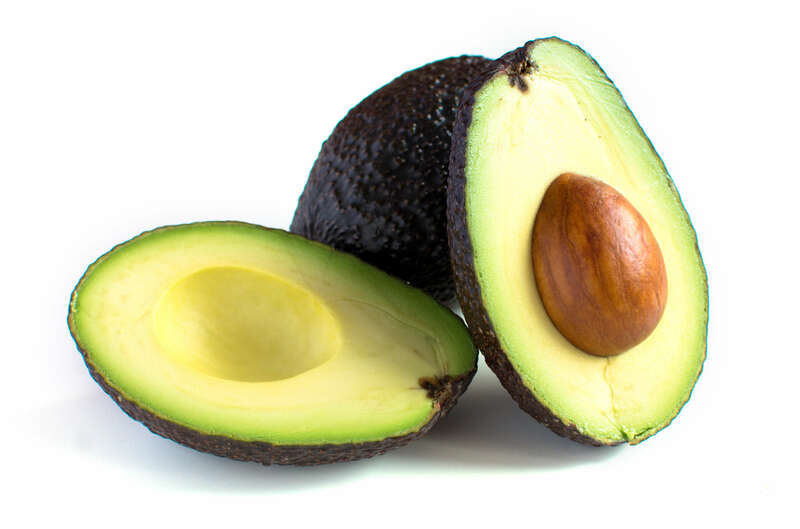 Just like avocado, it is also very high in fiber. I chop it and then roast it for 35-40 minutes or steam it for 20 minutes, then puree it. I leave the skin on for more fiber and phytonutrients (plant chemicals). I love green peas so it's not surprising that Vienna also loves them :) The vibrant green is the colour of health! Green peas are rich in antioxidant vitamins such as vitamin C and vitamin E, and a good amount of the antioxidant mineral zinc which is important for a healthy immune system. Recent research has shown that green peas are a reliable source of omega-3 fat in the form of alpha-linolenic acid (ALA). This makes it an ideal food for brain development. Peas are also a surprising source of protein. Their naturally sweet taste makes them an easy food to introduce to baby. I buy frozen organic peas and lightly cook them in some filtered water for about 2-3 minutes just to soften them up enough to puree them. I puree them with the same water. I highly recommend you make your own applesauce for your baby. Your kitchen will smell amazing! Just like sweet potato, I recommend you leave the peel on to get the most nutrition bang for your buck into your baby. Apples are a source of many different nutrients including vitamins A, C, folate and choline and minerals such as potassium, calcium and phosphorus. They are a source of soluble and insoluble fiber which is wonderful for your baby's gut health. Be sure to try my organic applesauce recipe. Place apple slices in a large baking dish. I used my Le Creuset pot. Sprinkle apples with cinnamon. Add enough water to the pot to come up about a quarter of an inch on the sides. This is to help bake the apples by creating steam. Bake covered for 35 to 40 minutes or until apples are soft. Once finished baking let cool slightly then transfer to a blender or a food processor and blend until smooth*. Refrigerate for 1 week or freeze for a few months. 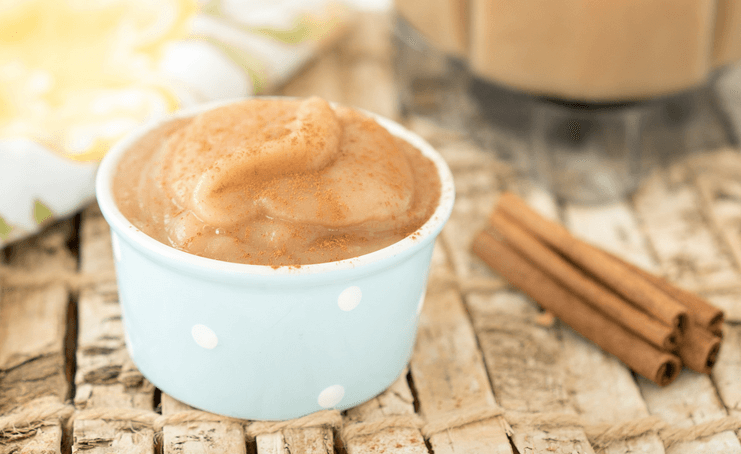 *I blended until the applesauce was super smooth because I'm using it as a baby food for my 6 month old. If you are making it for yourself or an older child then you could blend less to have some nice chunks. If there is a food (like broccoli -- Vienna hates broccoli!) your baby doesn't like, combine it with some applesauce, it may just win him or her over! • Don’t rush when you’re feeding your little one. Schedule enough time to make it an enjoyable and mindful experience for you both. Mess is totally fine! 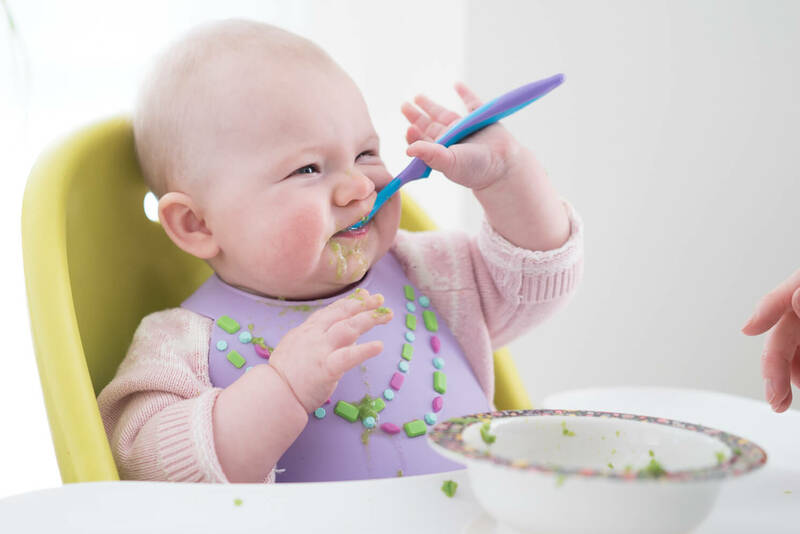 • Allow your babe to get their hands in and on the food so they can immerse all their senses in the act of eating. • Let your babe take the lead and grab the spoon if it is safe and they want to feed themselves with your supervision. • If at first your child rejects a food, try it again in a couple of days. Vienna does not like broccoli (yet). But so far, she’s made a funny face when eating most foods for the first time, and then the next time she loves them! Remember, every baby is different! • Rice and grain cereal can wait. These are foods that are often recommended as a baby’s first food but I do not recommend this. These foods are taking the place of something far more nutrient-dense like sweet potatoes. Make every morsel count! ? • If you notice that after introducing a new food your baby has digestive problems like gas or constipation, wait a few days before introducing it again. • Introduce foods one at a time and wait a few days before introducing a new food. • Make sure your babe is actually hungry before feeding them solids. I often give Vienna solids right after a nap. Right now she is eating two solid meals per day and all her other meals are breast milk. If you are breastfeeding, solids should be complementary to your milk. Aim to breastfeed as long as possible. Dr. Jonah recommends a goal of at least two years because the immune system benefits of breastfeeding are greatest in the second year. Doesn’t this make you wonder about the current breastfeeding guideline of six months?! Thank you so much to Jonah Lusis, Naturopathic Doctor, and Du La, Naturopathic Doctor, Acupuncturist, Birth Doula for the information you shared in this post. I hope you found this post useful mamas :) Have fun and be sure to post any questions you have for me below! My pleasure. So the current recommendations are that delaying introduction of foods can actually increase the potential for an allergy. Therefore, it is now recommended to introduce these allergenic foods earlier. That said, you can't really give a baby an almond (obviously)... so there are other ways. I haven't personally done nut and seed milks yet but there are a lot of nuts in our house so Vienna has definitely been exposed. I will be giving Vienna chia pudding very soon made with coconut milk. She just had egg yolks for the first time today and loved them... which is considered an allergenic food but I'm hoping to avoid allergies by doing earlier introduction. Hope that helps -- the key thing to remember is that early intro of allergenic foods reduces allergies. As you introduce these foods, do so slowly and watch how your baby responds. Take note of any allergic responses such as hives etc. I would suggest booking a session with Dr. Jonah or Dr. La if you want more custom advice. Hi Joy! Do you breastfeed your little one at the same time you give her solids? My little one doesn't seem to want to drink milk after eating solids (doesn't matter if it's bottle or nursing). Every baby is different but here's a basic schedule of what I'm doing.. breastmilk upon waking, solids just before first morning nap. Wake up from nap and have breastmilk. Solids again before 2nd afternoon nap. Wake up, solids, then breastmilk before bedtime. Sometimes if she's really hungry there will be another 1 or 2 breastmilk feeds in there. Your babe is probably just full so maybe do the breastmilk first and then wait a bit. I always space out breastmilk and solids about an hour apart or more. Hey, as far as peanuts go, as soon as safe means what ? This is so interesting and I am so thankful for your blog in so many ways ! Thanks Joy !! I personally would not introduce peanuts before 6 months, so anytime 6 months or later but before one year. You could mix 1/2 tsp natural peanut butter in with a puree or just give your baby a little on your finger. As with any allergenic food, I would not give your baby this right before bed but rather during the day when you can observe them for any allergic response. Hi Joy! What type of containers do you use to store food after preparing it and what types of bowls do you use when feeding your precious little one? Thanks! I have a whole bunch of different options right now... I have a silicon mat that has cute spots for bowls but I will use it when she's a little older and doing more than just purees. I have glass and BPA-free/pthalate-free bowls I use as well. I like the bowls with suction cups on the bottom. Not sure if you live in Toronto but Macklem's on Dundas has a lot of great options! Hello, your post was perfect in it's timing.. My daughter is 5 months old so I've been doing lots of research on baby food and introducing solids. I am wondering if you have any information on baby led weaning. 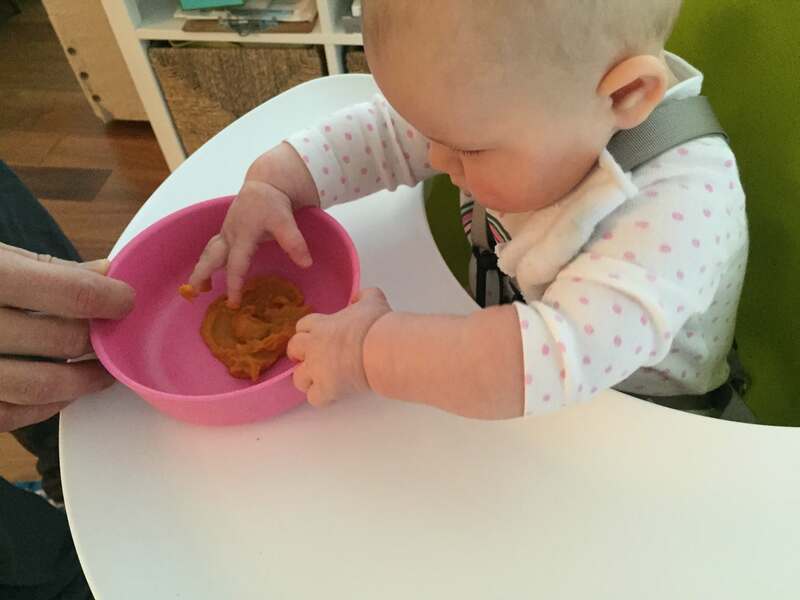 My only experience is with purees bit in feeling lots of pressure to do baby led weaning. Help! Thank you. I've tried BLW but haven't given it a solid effort on a daily basis. I will admit I'm kinda nervous about it, although many mamas love it and the reasons why make absolute sense to me. I think it just comes down to what you are comfortable with as a mom and also your baby. I think what I will do is slowly make the purees chunkier so she learns how to chew. As part of the caution on introducing nuts if one has a severe allergy as noted above, I think it's important to discuss with one's practitioner and delay consumption if any food allergy- not just severe. This would extend to both parents (not just mama) and other children even where neither parent has an allergy. Im also interested in your thoughts on baby led weaning. I read it can help them be a less picky eater which I like! Hi Joy, Thanks for this post, I was waiting for it. I just have a question what do you think about introducing yogurt to the baby? Thanks a lot for your blog! Hi Shelly, Vienna loves eggs! As for apple, I've been roasting it to make applesauce. 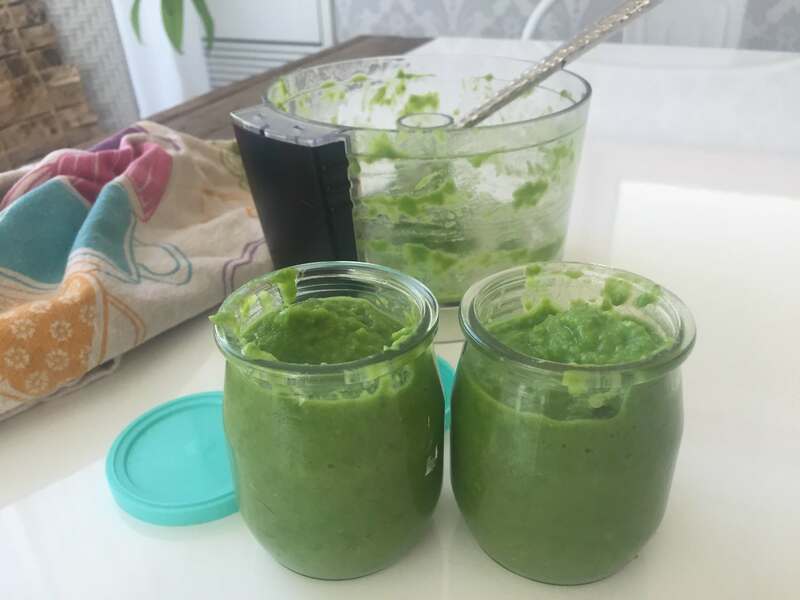 Not sure if you saw my recipe, but here it is:http://www.joyoushealth.com/blog/2016/03/04/homemade-organic-applesauce/ Vienna hasn't had a smoothie yet because I just started food introduction about 1.5 months ago, she's just 7 months. However, some fruits and veggies are more easier digested when slightly cooked. That doesn't mean you can't give them raw. If you blend it really well in a smoothie the process of blending breaks it down so it should be fine. Hope that helps! Re. bread, do you mean for me? Vienna doesn't eat bread. We buy the Silver Hills brand. Hi Joy! I am wondering how you are going to give baby rye? I know our babes are the same age, so 7 months is approaching soon and I'm wondering how to incorporate that? Thanks so much, love following you on Instagram for baby food ideas! Sweet! Avo is such a nourishing superfood for babies! I do freeze Vienna's food in small batches. You can some olive oil or coconut oil if you like. I cook the sweet potatoes for example with some olive oil. Hi Joy, I've been exclusively breastfeeding but will wean my little one when he is a year old. I'm not interested in transitioning him to cows milk as we don't drink it. Do you have any suggestions on what "milk" to transition him to? Thanks! It really depends on your baby! Many babies don't need to transition to "milk" necessarily. Goat milk is closer in amino acid profile to mama milk than cow's so that is a much better option. Have you started introducing solids yet? If your baby likes a lot of different foods then as long as he is getting enough fat, calcium etc from non-dairy foods it is not necessary to have him drink milk. Do you plan on breastfeeding the full 2 yearS? I don't have a specific plan per se. I'm letting Vienna lead the way on this one. Right now I'm still nursing about 5 times per day. However, if she's nursing early morning and just before bed when she's 2, that's fine with me! Hi Joy, thanks for taking the time to write about this. My little one is 5.5 months so the timing is great. My doctor was pushing rice cereal for the iron component saying that breast milk will not contain enough for my LO after 6 months. I'm hoping to stear clear of rice cereal but wondering if you've any suggestions on what I could use instead? Thanks! Beets, squash, sweet potato are all good first intro foods and a source of iron. I also don't agree with the reco of rice cereal -- it's not a great source of nutrition overall so you're on the right track! This post was perfectly timed for me. My babe is just about 5 months so we will be introducing solids soon. Thanks for the great info! I was just wondering if you have any book recommendations on this topic? Thanks! i'm not even a mother and i find all this information would be very helpful for new moms. Hi Joy! Wonderful post, I will definitely read this again when my LO is ready to start solids in a few months. Right now I'm BF with baby at 2 months, I'm wondering if there are any foods you recommend staying away from to minimize gas, did you pretty much eat anything? I would like to start eating broccoli and cabbage again since it's packed with nutrients but worry about giving gas to baby.. but want him to be familiar with the taste if I'm going to introduce them in the pureed forms. What do you recommend? Hi Joy! I love your high chair that you have! Which brand is it?? Do you happen to recall where you purchased the small glass containers in your photos. They look like the perfect size to make up a batch and store in the fridge or freezer. Thanks in advance! Hi Joy! Thanks for all the amazing information! I was wondering what your recommendations/guidelines would be for seeking out a naturopathic doctor? I have been wanting to go visit one more specifically for my son (19 months old) to get a little more guidance regarding holistic nutrition. Also, would you recommend toddlers taking a multivitamin since they don't always eat everything we wish they would? Love reading all the blog posts and following the little family on social media, it's a real inspiration. You make natural living is really attainable! Hi Joy, In essence you do recommend baby led weaning, correct? What are your thoughts on that approach? Thanks! Thanks SO much for post, Joy! I've been itching to start my 5 month old on solids for all the same reasons you did with Vienna. Of course, everyone brings up the cereal but I knew there was a much better way to do it! This post was so informative-Thank you! Hi Joy I was wondering what you mean by the comments "as soon as it's safe" next to the food. Particularly next to carrots. My daughter is almost 7 months and I wang to introduce carrots and wondering under what circumstance would it be unsafe. Also what type of fish would you recommend as a first food ? How did you make sure Vienna was getting enough iron? I breastfeed and started with a chicken bone broth and then avocado but I'm worried about his iron intake. If you're still breastfeeding the iron that is in your milk is literally the most readily available, absorbable iron your baby will ever get :) If you're formula feeding then there is iron in the formula. Why are you worried? Is your little one not thriving? If that's the case I would bring him/her to your paediatrician for a check in :) Otherwise, if you're giving a variety of foods plus breastmilk or formula then everything should be good! I thought I read that breastmilk didn't have enough iron but the more I read that seems to be wrong. He is doing just fine with height and weight I am just starting the solids and wanted to make sure he got enough iron. Thanks for the quick reply and for this post. I really didn't want to start with cereals and this helped me choose what to start with. Hi joy, Do you recommmed trying the oatmeal cereal they have for babies ? Hi Joy, do you recommend dried apricots? Hi Joy(ous Team!) Just wanted to say thank you for the post and great info. My family doc is lovely but has been suggesting rice cereal since my son was not quite 4 months old. He's 5.5 now and I'm excited to start him on foods - and your post is very helpful. Thanks also for the reco ages ago about the Sprout Right book - it was a great resource during my pregnancy, too! Thanks for the post, Which is important for mothers. They can be created healthy food. But if you write about baby unsafe food under 1 year, that's will really good. Hi Shipra, I know this can be a frustrating time, sorry to hear you're going through this. Have you talked to your doctor yet? I'm not sure what foods you've tried but some babies can be quite picky. Have you tried bananas, sweet potatoes, zucchini, avocado, pear or apple sauce yet? Those are all very yummy first foods for a baby. It may be that you haven't found the foods that she really likes and therefore she prefers your milk. If she wasn't waking up all the time, I would suggest just keep doing what you're doing but she may be waking up because she's hungry. Also remember when introducing new foods to try 3-7 times before giving up. Hope that helps! Neat info about allergies :) What all you think about BLW? I read about it in a guide 'How to introduce solid foods to your baby' where it was just mentioned as well as finger foods. I think it might be funnier to make this as a major way of preparing food and puree only as a backup? Downside is a mess and gaging, but kid can eat by itself from the begining. Great post Joy! Thank you just weaning my 7.5 month old girl now. Did you give Vienna water when she was weaning? I’ve heard mixed thoughts on this. I have exclusively breast fed my little one and just started to introduce purées. Would love your view on whether babies need water when they’re weaning or if breastfeeding milk is okay alone. I started to offer water when she was around 1 years old if memory serves me correct because I didn't want her to have water instead of breast milk however I was nursing multiple times per day. If you wean completely before 1 year then you can do formula but if you can nurse till 1 year that is ideal. Hope that helps! Really informative article. Thanks for sharing it with us!